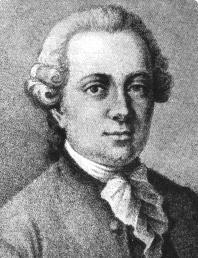 The earliest ant descriptions probably are those of Monomorium pharaonis and Monomorium salomonis by Carl Linnaeus in 1758. Forskâl's ant records are shown right. Bolton (1995: 190ff) listed them as incertae sedis from Egypt. 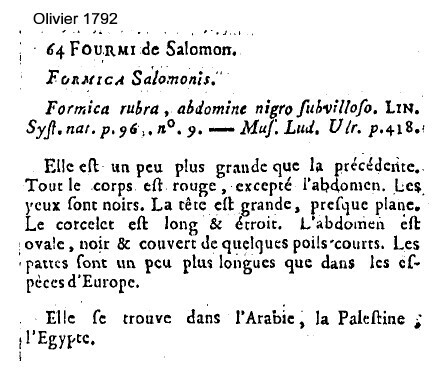 Only one of the species, F. salomonis, was given by Forskâl as from an Egyptian location, i.e. Alexandria. 23. b) Formica insultans Forskål (1775: 85, worker). .
22. Formica maligna (from Arabia or Egypt) black and with a single pedicel segment, pungent and from a dead scorpion = Pachycondyla sennaarensis. 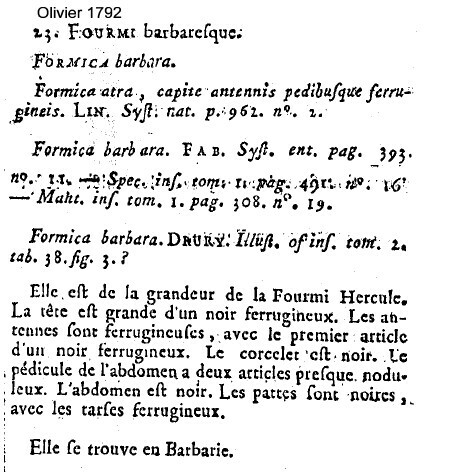 Bolton (1995: 190 ff) listed some Forskål names as identified by Fabricius, apparently twice, in 1775 and again in 1793 - example below; also Pheidole fervens synonym edax. G.A. Olivier (1792), in his contribution to the Encyclopédie Méthodique. Histoire Naturelle. Insectes, vol 6, included the species of Fabricius and others - possibly Crematogaster aegyptiacus - Formica aegyptiaca ; Messor arenarius - as Formica arenaria ; Messor barbarus - as Formica barbara ; Messor barbarus binodis - as Formica binodis ; Camponotus maculatus or aegyptiacus - Formica maculata ; Monomorium pharaonis - as Formica pharaonis ; Monomorium salomonis - Formica salomonis ; and Cataglyphis viatica - as Formica viatica . 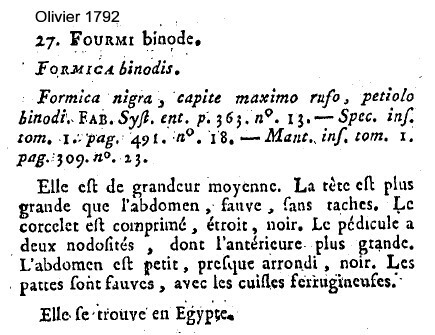 Pierre Latreille (1802) gave a few from Egypt, mainly the Fabricius species but also the new description of Camponotus cruentatus - as Formica cruentata . Jean Victor Audouin & Jules-César Savigny and the great Egyptian Expedition. In 1802, Napoleon ordered the Imperial Press to begin publication of the visual record set down by the Egyptian expedition of 1798. Initially, the work was published in instalments between 1809 and 1829. Four hundred copper engravers worked for some twenty years on the Description. The resulting monumental work comprises ten folio volumes with 837 copper engravings and 3000 illustrations edited by the best minds in France (a complete facsimile edition of the Description de l'Egypte, was published in 1997 by Benedikt Taschen GmbH, Cologne). 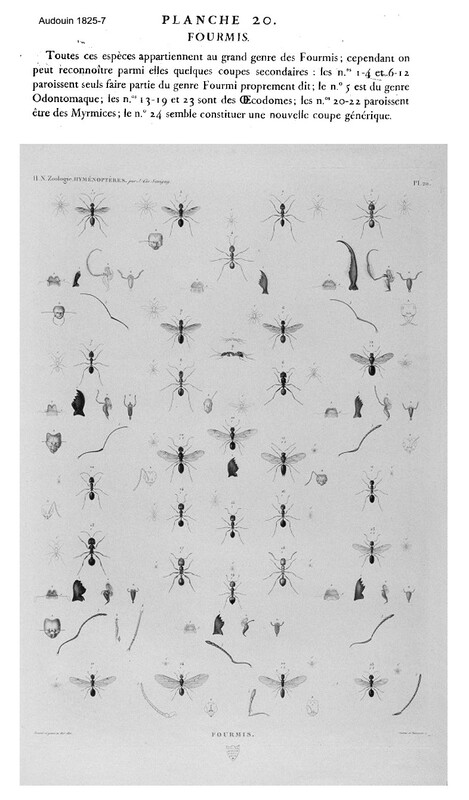 On insects at least, Jules-César Savigny engraved most of the plates; ants were illustrated on Planche 20, p 202. 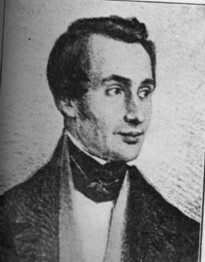 Jean Victoire Audouin (April 27, 1797 - November 9, 1841) was a French naturalist, entomologist and ornithologist. Audouin was born in Paris and studied medicine. 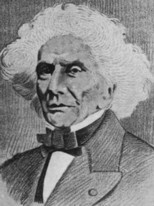 In 1824 he was appointed assistant to Pierre André Latreille as Professor of Entomology at the Muséum National d'Histoire Naturelle, and succeeded him in 1833. In 1838 he became a member of the French Academy of Sciences. Audouin, J.V. 1826. 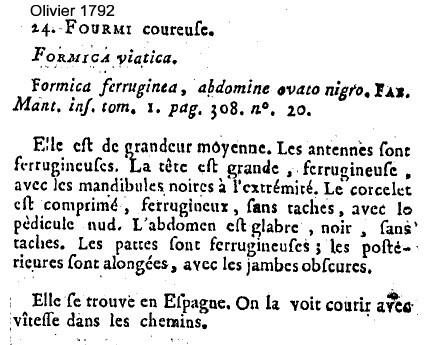 Explication sommaire des planches (Mollusques - Annelides - Crustacés - Arachnides - Insectes - Echinodermes - Zoophytes - Ascidies - Polypes - Hydrophytes - Oiseaux) dont les dessins ont été fournis par M.J.C. Savigny, pour l'histoire naturelle de l'ouvrage (offrant un exposé des caractères naturels des genres avec la distinction des espèces (Polypes, pp. 225-244). 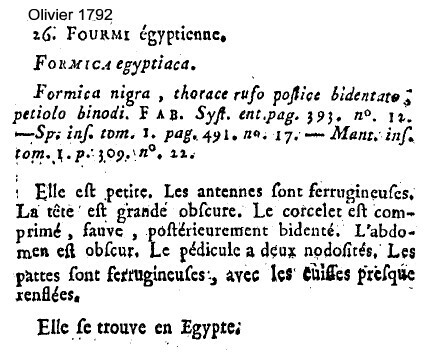 In Description de l'Égypte, ou, Recueil de observations et des recherches qui ont été faites en Égypte pendant l'expédition de l'armée française, publie par les ordres de Sa Majesté l'empereur Napoleon le Grand. E.F. Jomard, ed., Imprimerie imperiale, Paris, 339 pp. 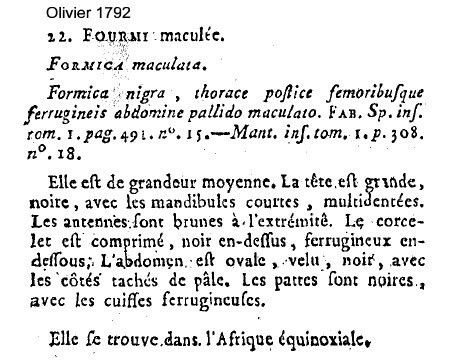 Histoire Naturelle: text: 1824-1829; plates: 1826. Text: 6 volumes, octavo. 1 folding engraved plate, 4 folding letterpress tables; Plates: large folio (format Jesus), 244 engraved plates jpg extract. Léon Dufour (1862), described Cataglyphis savignyi, Savignyi specimens 1 and 2. Dufour refers to searching the literature of the prominent authors of preceding years but it seems none of the others were described or identified. There appears also that there was an unpublished monograph by Dufour *, as Nylander (1856b) referred to it when he gave a description of Camponotus cruentatus opacus, which he said was identifiable as Savignyi's specimen 7. 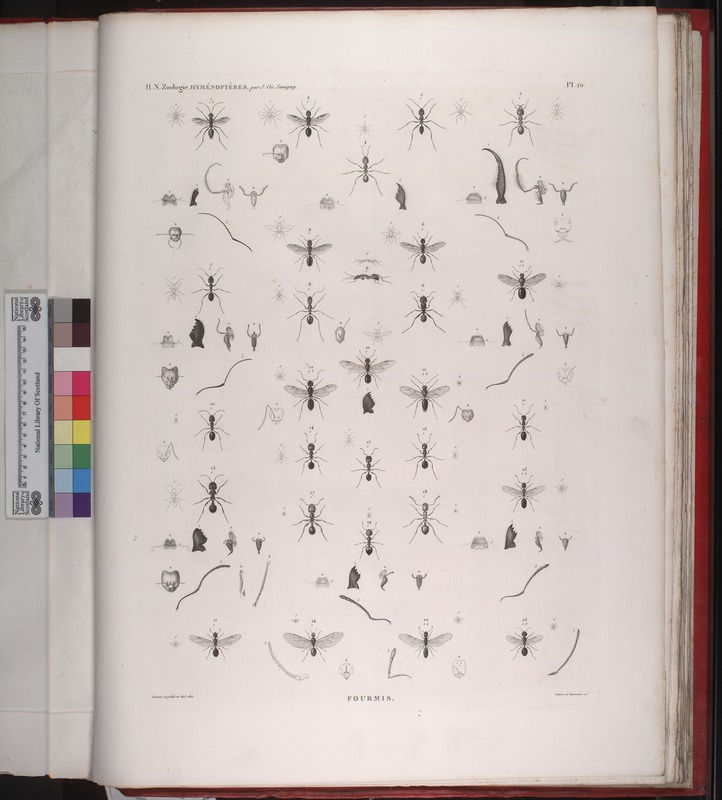 * Mayr (1861: 16) has a literature list which includes - "Dufour (Leon), Annales de la Société entomologique de France V" - this was not listed by Bolton (1995); Mayr listed "Camponotus marginatus", as from Egypt. Frederick Smith (1805-1879) - His "Catalogue" (1858b) included his description of Camponotus sericeus (p 30) - as Formica obtusa . but had no other records from Egypt. Smith's descriptions, however, were in a simplistic inadequate style no better than those of Linnaeus a century earlier. We now regard this as Camponotus obtusus. Frederick Smith (1805-1879) was born in London and trained as a engraver on steel. He became interested in the habits of Hymenoptera. 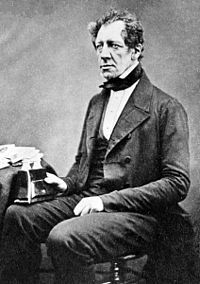 In 1850 Smith was appointed as Assistant in the Zoological Department of the British Museum, and in 1875 became Senior Assistant. 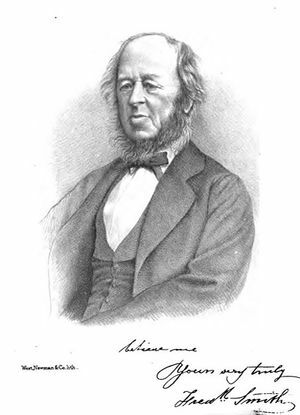 His published works included the Catalogue of the Hymenopterous Insects in the British Museum (1853-1859), and the Catalogue of the British Fossorial Hymenoptera (1858). He was President of the Entomological Society of London in 1862 and 1863. 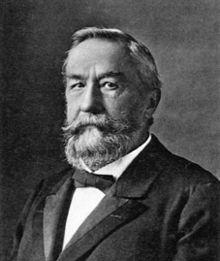 Gustav Mayr - Mayr appears to have been the first myrmecologist to approach the task of taxonomy in a way that remains essentially unchanged to this day. His descriptions are precise and careful and, in his 1862 paper - , he provided dichotomous keys at both Subfamily and Genus levels. Although no collection details are given, he reports specimens held in the Zoological Cabinets in the Vienna Museum which originated from Egypt; most being from Sinai Peninsula and collected by R. von Frauenfeld (* = not by v. Frauenfeld, simply in Cabinets). These include *Camponotus maculatus; *Camponotus sericeus; Cataglyphis albicans; Dorylus (Typhlopone) helvolus oraniensis; Nesomyrmex angulatus (Leptothorax angulatus), new species; Tetramorium bicarinatum (T. guineensis); Pheidole sinaitica, new species; Monomorium pharaonis, with a full description; *Carebara sicheli, from White Nile (Sudan); *Crematogaster (Crem.) aegyptiaca, new species; Crematogaster (Crem.) inermis, new species. In 1866 (Mayr, 1866a) he added Plagiolepis mediterranea, new species. 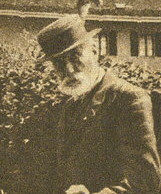 Mayr, Gustav L. (b. October 12, 1830; d. July 7, 1908) in Rozzano (close to Milan). In 1863-1882 he was appointed as a college teacher and worked up to 1892 in collaboration with the Museum of Natural History (at that time "k.k. Hof-Cabinet"), but was not appointed to the Museum; he was a college teacher ("Realschul-Professor") in Vienna. In 1894 he was honoured by the title of a "Kaiserlicher Rat" ("Imperial Councillor"). Some of his collection is deposited in the Naturhistorisches Museum Wien, Austria (NHMW) and some is in the Staatliches Museum für Tierkunde, Dresden (SMTD). (With thanks to Prof Luitfried v. S.-Plawen for information). Francis Walker (1871). 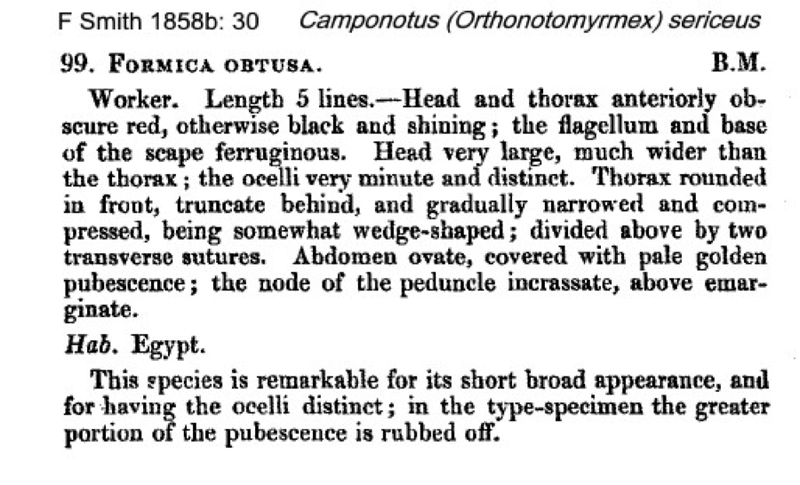 A list of Hymenoptera collected by J.K. Lord, esq., in Egypt, in the neighbourhood of the Red Sea, and in Arabia 59 pp, London - Cataglyphis bicoloripes . Collections in Egypt by J K Lord were at - Cairo, Shoobra, Heliopolis, Red Mountains and Giza Pyramids. Cataglyphis bicoloripes Walker - queen only (Walker, 1871: 10, queen) [not in Santschi, 1929b] - Agosti (1990: 1495) noted this as species incertae sedis, as the Walker's description was inadequate and no specimens could be found in the collection (Natural History Museum, London) . Aphaenogaster pallescens Walker - unrecognised by Bolton (1995) . O. Radoszkowsky (1876 ) Compte-rendu des hymenoptères recueilles en Egypte et Abyssinie en 1873. Tr. Russ. Entomol. Obshch., 12, 111-150. The specimens from Egypt were collected by Dr Dziedzicki, a specialist in Diptera, who was a member of a scientific expedition led by Comte Alexandre Branicki. This includes Cataglyphis argentatus n sp, also Cataglyphis viatica. Other species in the paper were from Ethiopia. 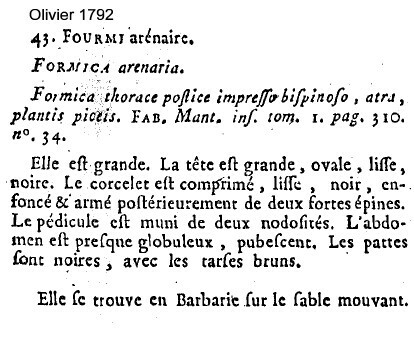 The first page of his paper gives his title as "Général d' Artillerie". 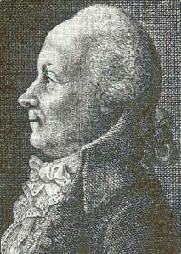 Radoszkowsky, who gave his address as St Petersburg, described the work as a continuation of the descriptions of Hymenoptera earlier made by Spinola and Klug. Ernest André (1881b ) reported four species - Cataglyphis niger (as a new variety of C. viaticus), Paratrechina longicornis, Messor arenarius (as Aphaenogaster arenaria Fab) and Pheidole jordanica (as P. sinaitica but differing) - collected from Alexandria by M Abeille de Perrin at the start of a journey through Palestine, Lebanon and Syria. He appears to have published papers on ant taxonomy from 1874 to 1905, with his collection of specimens being in the Museum in Paris. His major work was Species des Hymenoptères d'Europe et d'Algérie published in sections in 1881-1886, which has keys, descriptions and numerous illustrations. Auguste Forel (1886f: 75) recorded Cataglyphis bombycinus as Myrmecocystus bombycinus Roger, from the Oasis de Bahrych and from Harrars, coll. de Saussure; Cyrenica (Berlin Museum); soldiers from Egypt, Nubia, coll. de Saussure; also Lepisiota frauenfeldi a variety with the worker having the metanotum with spines longer than the width between their bases, from Egypt, collected by M Ehrenberg, Berlin Museum. 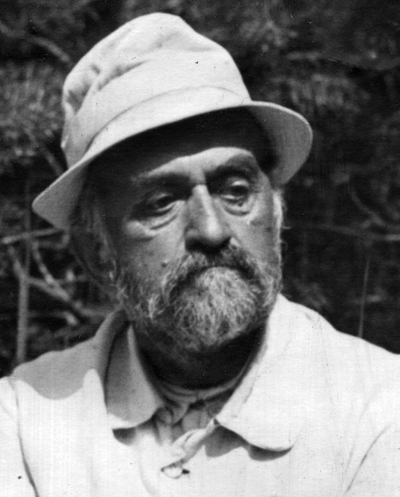 Almost forty years after his previous paper, Mayr (1904b ) reported on ants collected in Egypt and the Sudan by the Jãgerskiöld Expedition of 1901. Most of the ants listed were collected in Sudan. Those from Egypt were - Monomorium nitidiventre, Monomorium salomonis, Messor aegyptiacus, Pheidole jordanica (as Pheidole sinaitica ssp laticeps new ssp), Paratrechina jaegerskieoldi (as Prenolepis jaegerskioeldi) new species. He made reference to a one-line entry in his 1893 paper describing ants collected by Dr Fr Stuhlmann in East Africa, where he listed "11. M. viaticus Fabr. Cairo" (Mayr 1893: 5) and states the correct determination was Cataglyphis desertorum (as Myrmecocystus vaiaticus Fabr. subspec. desertorum Forel. Forel (1907a ) described ants from the Hungarian National Museum, including a number collected by M Biró, on a journey to the Far East. From Egypt were a few species - Tetramorium simillimum, from Ismailia; Monomorium salomonis from Alexandria; Monomorium subopacum from Suez; Pheidole pallidula from Alexandria; and, Crematogaster inermis from Suez. Forel (1913d ) reported Cardiocondyla nuda v fajumensis from Fajum, coll U Sahlberg; Pheidole teneriffana from Cairo; Tetramorium sahlbergi from Caiiro; Nesomyrmex angulatus as Leptothorax angulatus from Luxor; Cataglyphis isis from Heliopolis; Lasius lasiodes from Fajum. Felix Santschi (1908 ) in only the second paper in what was an amazingly prolific set of publications over some thirty years, reported specimens sent to him from Cairo by his friend M. Borcard - Hypoponera ragusai, Monomorium bicolor, Monomorium salomonis, Monomorium destructor (as gracillimum), Crematogaster inermis, Pheidole teneriffana, Messor barbarus r capitatum var mediorufa nov, Paratrechina jaegerskioeldi var borcardi nov., Cataglyphis bicolor, Camponotus maculatus, and Camponotus thoracicus var xerxes [now Camponotus cognatocompressus, Forel (1904b: 379, all forms, from "Africa"; unavailable name Camponotus rubripes r cognata var cognatocompressus Forel, 1886f: 151; raised to species under name xerxes by Pisarski, 1967: 414, but probably thoracicus (see Santschi, 1938a). 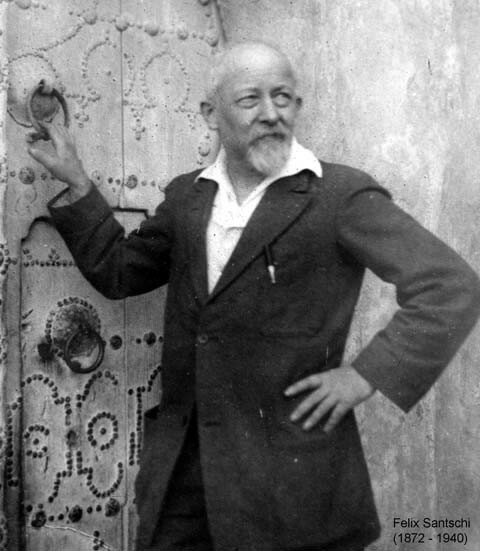 Santschi himself was described by Forel (1904c) as "M. le Dr. Santschi, de Lausanne, établi comme médecin dans la ville sainte des Arabes de Tunisie" and seems to have lived mainly in Kairouan, Tunisia, around where he made personal studies and collections of primarily desert ants. Kairouan, now known as Al Qayrawân, is also called the City of 100 Mosques. The earliest of his own reports of personal collections in Kairouan is recorded as January 1906 (Santschi, 1907), although Forel (1905b) described Monomorium santschii [as Wheeleria santschii] as collected by Santschi at Kairouan on 19 August 1903, and Solenopsis santschii as collected in a Kairouan street on 1 August 1903. 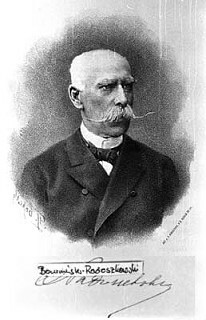 In his 1907 paper, Santschi dedicated the newly named species Leptothorax foreli to Professor A. Forel, "who initiated my interest into the so interesting study of ants" [my translation]. What appears to be his signature (right) is written on the copy of his 1932a paper that has been scanned for the Antbase website. Photo below. 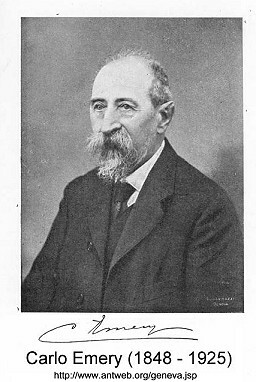 Carlo Emery 1848-1925. 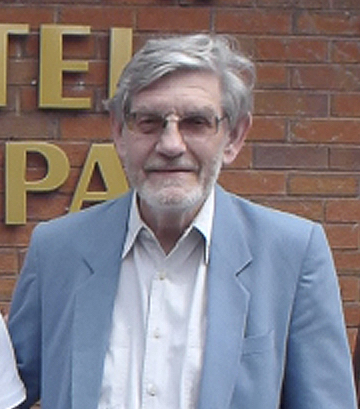 Around of his 41 papers include reports of ants from Egypt. Carlo Emery (25 October 1848, Naples – 11 May 1925) was an Italian entomologist. 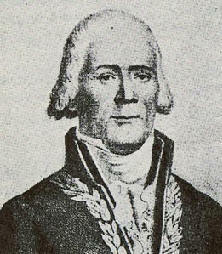 He is remembered for Emery's rule, which states that insect social parasites are often closely related to their hosts. Early in his career Carlo Emery pursued a course in general medicine, and in 1872 narrowed his interests to ophthalmology. In 1878 he was appointed Professor of Zoology at the University of Cagliari, remaining there for several years until 1881 when he took up an appointment at the University of Bologna as Professor of Zoology, remaining there for thirty-five years until his death. Emery specialised in Hymenoptera, but his early work was on Coleoptera. Prior to 1869, his earliest works were a textbook of general zoology and papers on fishes and molluscs. From 1869 to 1925 he devoted himself almost entirely to the study of ants. Emery published extensively between 1869 and 1926 describing 130 genera and 1057 species mainly in Wytsman's Genera Insectorum series. Emery’s collections of Hymenoptera are in Museo Civico di Storia Naturale di Genova. His Coleoptera are in Museo Civico di Zoologia di Roma. He died at Bologna in 1925. V Karavaiev 1864-1939 (also known as W Karawaiew; 1911 ) reported primarily collections from Sudan but gave some records from Cairo and Aswan, at each end of the river journey, which seems to have begun in mid-February and taken until the end of March. He noted temperature readings in the Zoological Garden in Khartoum on 20 March to 3 April. He left Sudan from Port Sudan. In identifying the ants he had help from Dr F Santschi and Professor C Emery. From Egypt, he listed - Messor aegyptiacus major and minor from Cairo; Monomorium destructor (gracillimum) at Elephant Is, Aswan; Monomorium salomonis from Aswan and the desert at Giza; Monomorium nitidiventre from Aswan and Cairo; Tetramorium caespitum at Cairo; Cardiocondyla mauritanica at Aswan Municipal Garden; Tapinoma erraticum in Cairo; Paratrechina jaegerskioeldi from Cairo (Marg & Gezire garden); Cataglyphis lividus auratus at Aswan; Camponotus maculatus at Cairo; Camponotus thoracicus var xerxes at Cairo. F Santschi (1912b ) included a description of Messor arenarius stirps thebaicus n st, from Egypt, without locality, in Museum of Paris, collector Le Tourneux. F Santschi (1915c ) included a description of a new species, Camponotus (Myrmotrema) rhamses from "Haute-Égypte: lac No (Dr Reichensperger leg. ), 2 workers"; specimens probably from the Paris Museum (location possibly Thebes - the ruin of No-Amon?? - (25.7° N 32.645° E) - which fits with the previous entry. W.M. Wheeler & W.M. 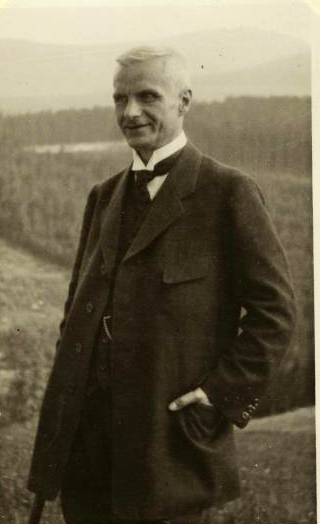 Mann (1916 ). The ants of the Phillips expedition to Palestine during 1914. Bulletin of the Museum of Comparative Zoology at Harvard College, 60, 167-174 - from Sinai were - Tetraponera bifoveolata var syriaca at Wadi Gazelle; Messor rufotestaceus from Wadi Gharandel; Messor concolor from Wadi Feran; Messor aegyptiacus from Wadi Feran, Wadi Gazelle, Mt Sinai, also Cairo and Fayum; Pheidole pallidula from Wadi Feran & Wadi Gazelle; Pheidole sinaitica from Cairo; Crematogaster auberti ssp antaris from Mt Sinai; Crematogaster inermis from Mt Sinai, Wadi Gazelle & Wadi Feran; Monomorium niloticum from Wadi Gazelle; Monomorium salomonis from Wadi Gharandel; Monomorium nitidiventre from Cairo; Monomorium abeillei from Wadi Feran & Wadi Gazelle; Tetramorium schmidti from Mt Sinai; from Mt Sinai; Tetramorium punicum from Mt Sinai; Bothriomyrmex syrius from Wadi Gazelle; Lepisiota carbonaria from Wadi Gazelle; Plagiolepis pygmaea from Wadi Feran; Paratrechina jaegerskioeldi from Cairo; Cataglyphis bombycinus from Lake Fayum; Cataglyphis bombycinus sinaiticus from Wadi Gazelle; Cataglyphis lividus from Wadi Gharandel; Cataglyphis niger from Cairo & Lake Fayum; Cataglyphis nodus var orientalis from Wadi Feran & Wadi Gharandel; Camponotus oasium from Wadi Feran; Camponotus thoracicus var cypriacus from Wadi Gharandel; Camponotus thoracicus var sanctoides from Wadi Feran & Mt Sinai; Camponotus thoracicus var mortis from Wadi Feran; and, Polyrhachis lacteipennis ssp simplex from Wadi Feran. William M. Mann (1886–1960) was an American entomologist and the fifth director of the National Zoo in Washington, D.C. from 1925 until 1956. The Egypt findings were - Messor medioruber and Monomorium salomonis atrata from the Arabian Desert Mokattam near Cairo; Monomorium destructor from Aswan; Lepisiota gracilicornis at Aswan; Cataglyphis bicolor at Luxor and Aswan, Gizeh & Cairo; Cataglyphis bombycinus at Abu Simbel and Wadi Halfa; Camponotus maculatus at Cairo (in hotel); and, Campontous fellah from the Arabian Desert Mokattam near Cairo. F Santschi (1928f ) - had solely a description of Messor rugosus new stirps crawleyi from among the Hall material and listed in Alfieri (1931). 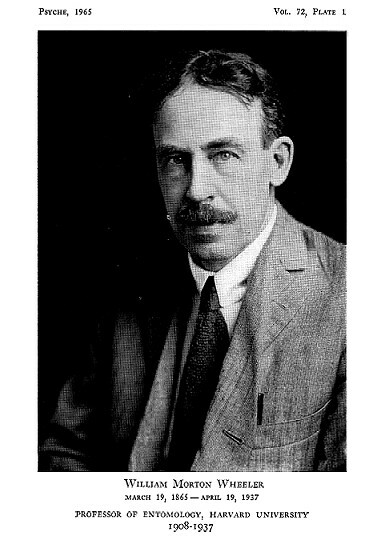 A Alfieri (1931 ) described how W J Hall, as entomologist in the Plant Protection section of the Ministry of Agriculture organised a survey of ant species that might be affecting plants by transporting Coccids and Aphids from plant to plant. Eight teams were organised and sent to cover the whole country. After two months work, thousands of ants, in 686 tubes, with information tickets within were sent to W C Crawley at Holland Park (London). His identifications revealed 23 species, most already known from Egypt. 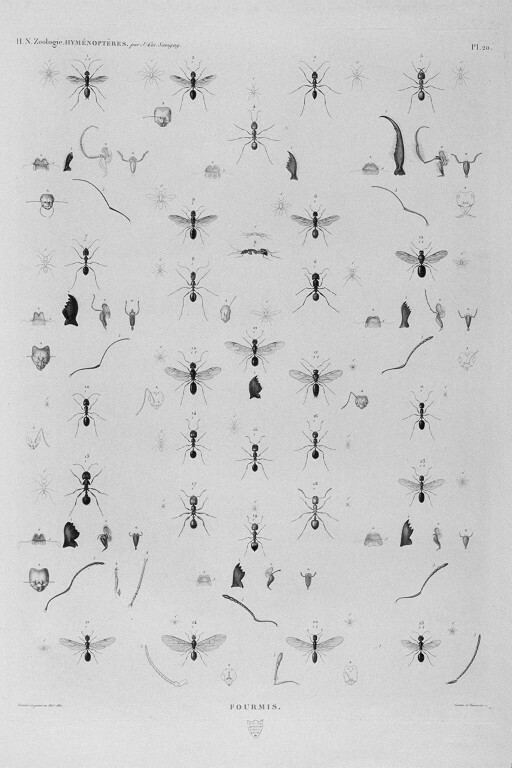 Alfieri stated also that Felix Santschi had told of his intention to make a monographic revsion of the ants of Egypt. (one already in Santschi, 1928f). From Santschi (1938a) it seems that Alfieri also had material collected in earlier years, as Santschi gave dates from early 1914 to 1923 among the collection details. The species listed were - Monomorium nitidiventre, Monomorium destructor (gracillimum); Monomorium pharaonis, Monomorium salomonis sommieri, Monomorium subopacum, Cardiocondyla emeryi mahdii, Crematogaster inermis, Pheidole jordanica, Pheidole teneriffana, Messor arenarius, Messor aegyptiacus, Messor structor, Messor rugosus crawleyi, Tetramorium punicum, Tapinoma erraticum, Plagiolepis pygmaea, Paratrechina jaegerskioeldi, Paratrechina longicornis, Cataglyphis lividus, Cataglyphis bicolor, and, Camponotus aegyptiacus. 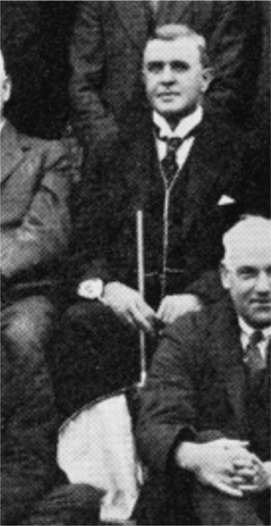 Anastase Alfieri (March 23, 1892 Alexandria – 1971 Cairo) was an Italian entomologist who worked principally on Coleoptera but, also, with Hermann Preisner, on Heteroptera. Most of his work was on the fauna of Egypt. His collection is shared between the natural history museum in Tutzing de:Tutzing and the National Museum of Natural History in Washington D.C. (Smithsonian). 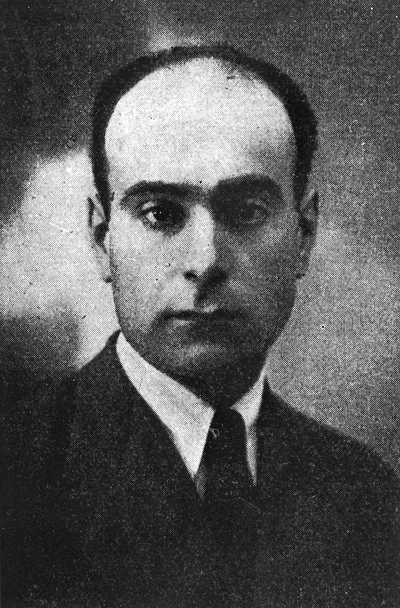 Carlo Menozzi 1892-1943 (1929e, ). Formiche del Sinai, raccolte dal Dr. F. S. Bodenheimer, con descrizione di una nuova specie di Monomorium del sottogenere Equestrimessor. Pages 125-128 in Bodenheimer, F. S. and O. Theodor. Ergebnisse der Sinai-Expedition 1927 der Hebraeischen Universitaet, Jerusalem, Leipzig. 142 pp. The species listed were Messor foreli, Pheidole jordanica, Crematogaster (Cr.) jehovae, Crematogaster (Cr.) inermis, Monomorium venustum, Monomorium salomonis sommieri, Monomorium bodenheimeri (nsp), Lepisiota nigra, Camponotus (Tanaemyrmex) fellah, Polyrhachis lacteipennis, Cataglyphis lividus, Cataglyphis niger & Cataglyphis nodus. Primarily publishing from 1918 (under name C Minozzi, from Modena) to 1942 (C Menozzi, Ferrara), with a joint paper (apparently posthumous) with M Consani in 1952. His papers do not give an address other than an Italian place name; also Chiavari. F Santschi (1934d ) In July-August 1933, Santschi took a short cruise in the eastern Mediterranean. amomg the stopping places was Alexandria. He collected in the public gardens on 8 August 1933, finding Pheidole teneriffana and Paratrechina jaegerskioeldi. 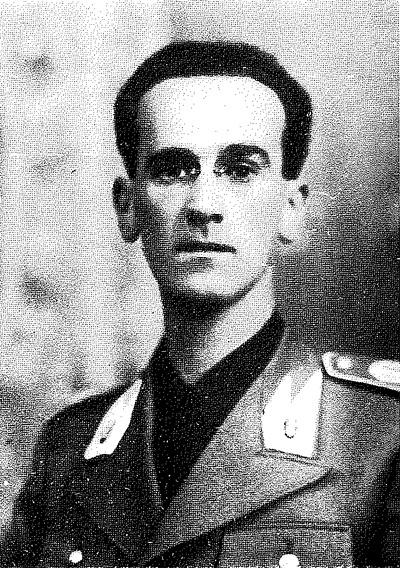 B Finzi 1897-1941 (1936 ). in the "Risultati scientifici della spedizione di S.A.S. il Principe Alessandro della Torre e Tasso nell'Egitto e Penisola del Sinai" reported collections made in a widespread survey by A. Schatzmayr, K. Koch and W. Wittmer. Finzi tabulated 80 forms,including varieties and subspecies; the lists are at species 1-40 and species 41-80. Modern names are - 1. Hypoponera ragusai; 8. Messor aegyptiacus sahlbergi; 9. probably Messor aegyptiacus; 12. Messor maculifrons; 13. Messor ebeninus; 29. Monomorium niloticum; 39. Monomorium destructor; 43. Nesomyrmex angulatus; 46. Tetramorium taueret; 48. Tetramorium sahlbergi; 49. Pyramica (Trichoscapa) membranifiera; 51. Plagiolepis ancyrensis; 52. Plagiolepis maura; 53. Lepisiota frauenfeldi aegyptiaca; 54. Lepisiota syriaca; 55. Lepisiota nigra; 56. Lepisiota splendens; 57. Lepisiota frauenfeldi opaciventris; 58. Lepisiota gracilicornis; 59. Camponotus (Tanaemyrmex) fellah; 60. Camponotus (Tanaemyrmex) thoracicus; 61. Camponotus (Tanaemyrmex) aegyptiacus; 69. Cataglyphis lividus; 70. Cataglyphis lividus ambigua; 71. Cataglyphis albicans auratus; 73. Cataglyphis savignyi; 74. Cataglyphis desertorum; 75. Cataglyphis niger; 76. Cataglyphis isis; 75. Cataglyphis niger pharao; 79. Cataglyphis bombycinus; 80. Cataglyphis sinaiticus. F Santschi (1938a ) "Quelques nouvelles fourmis d'Egypte", gave further results, with some new forms, from the Alfieri survey of 1925 and other collections (*denoted as already known but new to Egypt) new forms)- Dorylus (T.) fulvus rufescens from 3 locations; Aenictus fuscovarius st sagittarius nov. from Dakhla Oasis (coll Stoney) and Dorr (coll Adair); Messor ebeninus from Wadi Tamanid; Messor aegyptiacus from four locations; Messor foreli from Bir Sheftun, "arabian desert north Nag-Hamadi"; Messor fellah from three locations; Messor rufotestaceous from Wadi Hof; Messor arenarius st alfieri nov from Medai, Cairo (coll A Borcard), Mariout (coll Storey) and Alexandria; Messor arenarius var diabolus nov from El Arich, Sinai (coll Graves); Messor arenarius st thebaicus from three locations*; Messor niloticus sp nov from Mariout (no details, 10.iii.1914); Aphaenogaster splendida from Cairo*; Pheidole teneriffana from Ghezireh and Giza; Pheidole sinaitica from Meadi & Mariout; Crematogaster (Cr.) auberti nigripes from 6th Tower, Suez Roda & Dekhelia; Crematogaster (Cr.) jehovae from Alfia; Crematogaster (Cr.) inermis from Hammam (coll Mariout) & Nag-Hamadi (coll Storey); Crematogaster (Cr.) inermis ssp lucida from Wadi Hof, Embabaa & Ras-el-Bar*; Monomorium destructor (gracillimum) from several locations; Monomorium nitidiventre from Ghezireh & Giza; Monomorium salomonis from Meadi; Monomorium areniphilum fezzanensis from Wadi Hof*; Monomorium pharaonis from Ghezireh; Nesomyrmex angulatus (Leptothorax angulatus) from Cairo; Tapinoma simrothi var phoenicum from Cairo; Plagiolepis pallescens var isis nov from Ghezireh; Camponotus aegyptiacus from many locations; Camponotus aegyptiacus var hyskos nov from Cairo (A Borcard); Camponotus thoracicus var delta nov from Mariout; Camponotus thoracicus var herodes nov from five locations; Camponotus fellah from six locations; Camponotus (Myrmosericus) micans one male from Salkoum; Camponotus (Orthonotomyrmex) sericeus from Wadi Tawadid (SE Mersa Matrouh) & Dakla Oasis; Paratrechina longicornis from Ismailia; Paratrechina jaegerskioeldi from farms and gardens in several locations; Cataglyphis aenescens, one worker from Wadi Digila *[Santschi noted first finding in Egypt but the type location is Russia (Balkans) and his identification may be questionable); Cataglyphis bombycinus from nine locations; Cataglyphis albicans ssp opacus from Wadi Hof*; Cataglyphis lividus ssp ambigua from 7th Tower, Suez Road; Cataglyphis albicans ssp arenaria from Wadi Assiuti*; Cataglyphis bicolor ssp oasium from Meadi*; Cataglyphis desertorum from five northern locations; Cataglyphis savignyi from Salloum, Cairo & Suez; Cataglyphis niger ssp pharao from Wadi Assiuti & Kafr Hakim. Camponotus aegyptiacus from a house in Cairo; Cataglyphis bicolor from the beach at Mersa tal Kad Yayah (Sinai); Crematogaster inermis on the shore at Sheikh Riyah (Sinai); Paratrechina longicornis at Port Tewfiq, Suez, many in a laboratory. Donisthorpe (1939a ) - Cerapachys longitarsus synonyms cooperi and alfieri, collectors J Omer-Cooper (1935) and the Hall survey/A Alfieri (1925). The main report was in Donisthorpe (1942a ), "The Formicidae (Hym.) of the Armstrong College expedition to the Siwa Oasis" which lists 26 forms collected by J Omer-Cooper in July-August 1935. A second report was by Donisthorpe (1947e ). A H Mohamad (1979) unpublished PhD thesis - "Taxonomic studies on family Formicidae (Hymenoptera) in A.R. Egypt". Entomology Department, Faculty of Science, Ains Shans University, 288 pp. According to Mohamed et al (2001), this study was of "the Western Desert oasis and the Red Sea region". This systematic study was carried out to determine the recent status of the genera and species belonging to family Formicidae in Egypt. This study dealt with the morphological characters such as the number of palp joints, shape of the clypeus, mandibles, shape and comparative length of the antennal joints, shape of the thorax, petiole, postpetiole, spurs of the middle and hind tibiae, and the venations of the wings. Comparative studies, detailed plates of different parts of the ant's body, keys and systematic descriptions were arranged for the determination of these homogenous species. 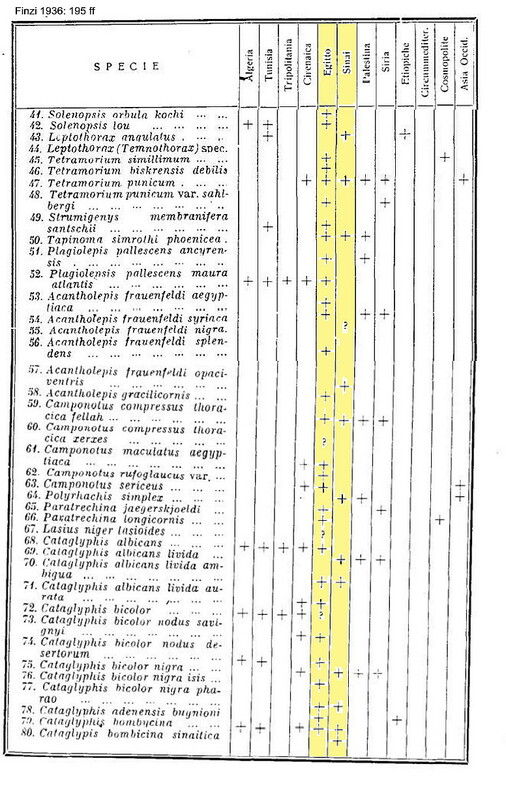 In this study, synonyms and determinations, localities and geographic distribution are given for the species, subspecies and varieties - some of which are not represented in the collections of Egypt - under 22 genera following five important subfamilies: Ponerinae, Dorylinae, Dolichderinae, Formicinae and Myrmicinae. One genus from the subfamily ponerinae: Genus Ponera; Two genera from the subfamily Dorylinae: genus Dorylus and genus Aenictus. Two genera from the subfamily Dolichoderinae: genus Tapinoma and genus Dolichoderus. Seven genera from the subfamily Formicinae: genus Lasius, genus Plagiolepis, genus Acantholepis (Lepisiota), genus Cataglyphis, genus Camponotus, genus Paratrechina and genus Polyrhachis. Ten genera from the subfamily Myrmicinae: genus Aphaenogaster, genus Messor, genus Pheidole, genus Monomorium, genus Tetramorium, genus Leptothorax, genus Cardiocondyla, genus Crematogaster, genus Strumigenys, and genus Solenopsis. There are 141 species, subspecies and varieties recorded from Egypt, of which 79 are present in collections in A.R. Egypt while 62 were recorded in the literature with no representatives in the collections. From 79 species, 55 species are intercepted from A.R. Egypt. Tapinoma simrotthi, Camponotus oasium, Camponotus thoracicus, Cataglyphis lividus, *Cataglyphis minimus, Cataglyphis niger, Catglyphis ruber, Cataglyphis sinaitica, Lepisiota nigra, Paratrechina jaegerskioeldi, Plagiolepis maura, *Aphaenogaster phillipsi, *Aphaenogaster syriaca, Cardiocondyla nuda, *Cardiocondyla wroughtonii, Crematogaster aegyptiaca, Messor ebeninus, Messor foreli, Messor rufotestaceus, *Monomorium carbonarium, Monomorium niloticum, Pheidole jordanica, Pheidole pallidula, Pheidole sinaitica, *Tetramorium brevicorne, *Tetramorium depressiceps, and,Tetramorium salwae sp nov. M.Sc - Mostafa R. Sharaf. (2001) Biodiversity, taxonomic studies and gamma radiation effect on ants species (Formicidae: Hymenoptera) in two governorates (Dakahliya and South Sinai). Summary of the Ecology part: The ant community prevailing in South Sinai and Dakhlyia governorates were inventoried at 30, 90, 900, 1620, and 1650 m. a. s. l. using 220 pitfall traps over a period of one year from March 1998 to February 1999 at eleven sites arranged in four different altitudinal regions, includes 27 species under 13 genera belonging to 3 subfamilies. In general, the species diversity was high at both low and high elevations represented by Wadi El-Arbaein, El-Mafareq , El-Mansoura, and Wadi El-Talaa, while it was relatively low at mid-elevations represented by Sahab. The similarity indices indicate that, its values were similar between adjacent elevations (1620 and 1650 m. a. s. l.) represented by Wadi El-Arbaein and Wadi El-Talaa respectively, and it was low between the agricultural ecosystems represented by El-Mansoura and the other desert ecosystem sites of South Sinai governorate. In brief, elevation and vegetation were the most important factors affecting the diversity, abundance and distribution of ant species in South Sinai and Dakhlyia governorates. Camponotus maculatus, Camponotus oasium, Cardiocondyla sp 1, Cardiocondyla sp 2, * Cataglyphis diehlii, Cataglyphis lividus, Cataglyphis niger, Crematogaster aegyptiacus, Messor aegyptiacus, Messor ebeninus, *Monomorium carbonarium, Monomorium niloticum, * Pheidole katonae, and Pheidole sp. Sharaf, M. R. 2006. Taxonomic and Ecological studies on family Formicidae (Order: Hymenoptera) in Egypt including some protectorates with a study of some insect fauna associated with ant species. Faculty of Science, Ain Shams University, Entomology Dep. Cairo, Egypt. (unpublished thesis), 340 pp. 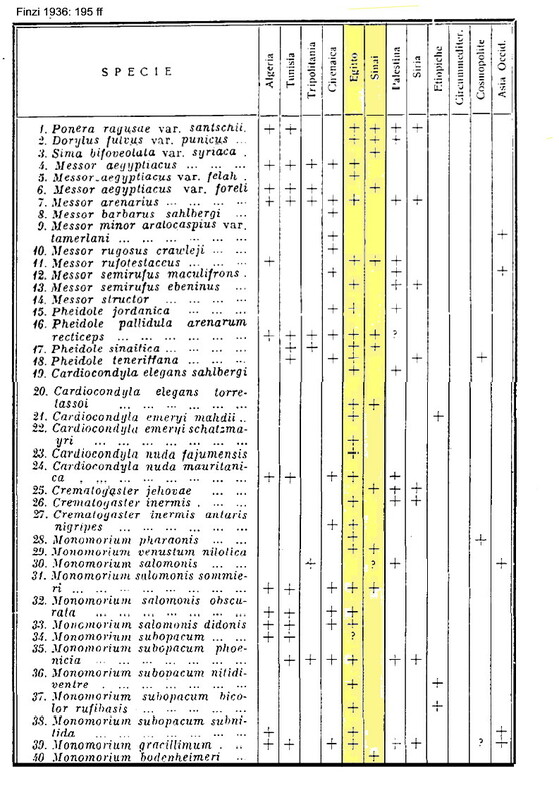 Twenty four genera belonging to eight subfamilies Aenictinae, Dorylinae, Myrmicinae, Pseudomyrmicinae, Ponerinae, Cerapachyinae, Formicinae, Dolichderinae are recognized, of which 123 species and 24 subspecies appear to be present in Egypt; A full synonymy is attempted for each species with appropriate literature. Keys are provided to all the Egyptian subfamilies, genera and species to enable the identification of the workers of all Egyptian ants. A total of 146 species and subspecies in twenty four genera are recognized, all of them are diagnosed and seven of which are Cerapachys collingwoodi; Cataglyphis agostii; Messor eglalae; Monomorium dentatum; Pheidole fadli; Solenopsis bakri and Tetramorium shirlae are described as new, moreover, eleven species *Plagiolepis schmitzii Forel, 1895, 1881; *Cardiocondyla israelica Seifert, 2003; *Cardiocondyla minutior Forel, 1899; *Monomorium exiguum Forel, 1894; *Monomorium jizane Collingwood & Agosti, 1996; *Oxyopomyrmex santschii Forel, 1904; *Pheidole katonae Forel, 1907; *Tetramorium bicarinatum (Nylander,1846); *Tetramorium lanuginosum Mayr, 1870; *Tetramorium shirlae Collingwood & Sharaf (in press); *Hypoponera punctatissima (Roger, 1859) are recorded for the first time from Egypt. Furthermore, Cardiocondyla minutior Forel, 1899 is recorded for the first time from the whole palaearctic region. In addition, the genus Oxyopomyrmex is a new record for the Egyptian ant fauna, it is represented by O. santschii Forel, 1904. Local and world distribution are given for each species as well as 157 figures of taxonomic characters are presented. In addition a glossary of anatomical and other specialized terms used in ant taxonomy are presented. Measurements useful for recognition of different species and diagnosis of different castes as queens and males of many species are given for the first time. 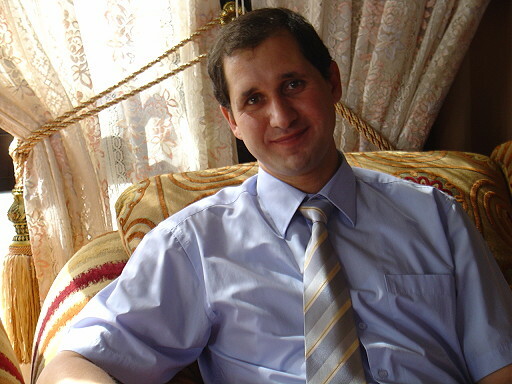 Mostafa Sharaf co-author of this website.